The August 25, 1945 edition of the Augusta Bulletin newspaper relates that Ray City was a mission station of St. Theresa’s Church at Albany, GA. The construction of St. Theresa’s Church began before the Civil War. The bricks were handmade by slaves on the Barbour Plantation near Newnan, GA. During the war the building was used as a Confederate hospital. St. Theresa’s Church, Albany, GA. The first resident pastor of St. Theresa’s Church was Father Stephen J. Beytaugh, appointed in 1875 by Reverend William H. Gross, Bishop of Savannah. James Aaron Swindle was born January 1, 1920, a son of Sarah Ellen “Stell” Daniel and James H. Swindle of Ray City, GA. His father was a farmer and merchant of Ray City who served as a City Councilman, Mayor, Chairman of the County Board of Education, and Georgia State Assemblyman (see James Henry Swindle). James A. Swindle graduated from Ray City High School in 1936. He attended two years of college and was afterwards employed by the U.S. Engineers at Florence, S.C. In 1940 he was residing in his parents household in Ray City; he was employed as a rodman for the highway department. On January 2, 1942 James A. Swindle enlisted as an Aviation Cadet at Turner Field, Albany, GA. It appears that James attended basic training at Ft. McPherson, East Point, GA. He attended advanced flight training at the Columbus Army Flying School in Mississippi where he learned to fly the B-26 Martin Marauder. This aircraft, while eventually becoming one of the chief bombardment weapons in the European Theater, was regarded as challenging to fly. James Swindle graduated September 6, 1942 commissioned a Second Lieutenant, and received the silver wings of a flying officer in the U.S. Army Air Force. 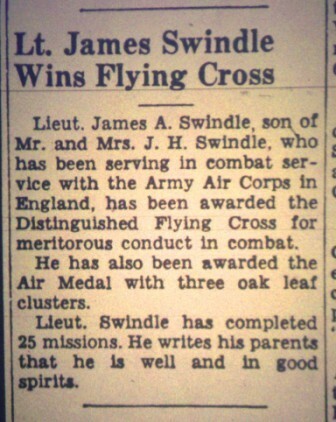 James A. Swindle graduated from Advanced Flight School, September 3, 1942. 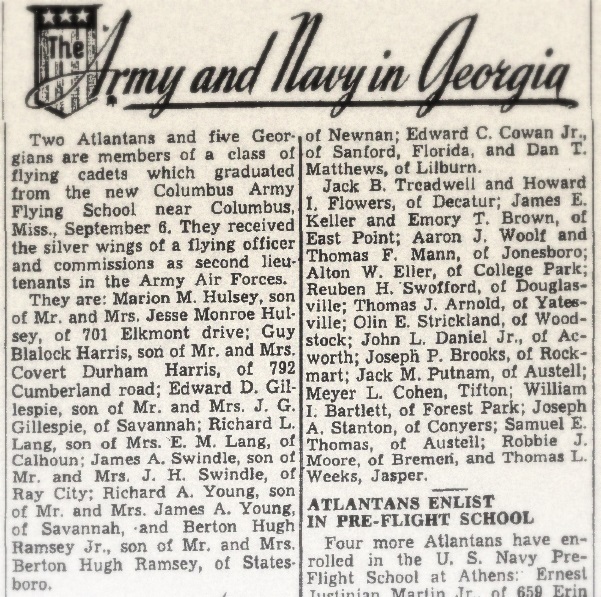 The Atlanta Constitution September 3, 1942 The Army and Navy in Georgia Two Atlantans and five Georgians are members of a class of flying cadets which graduated from the new Columbus Army Flying School near Columbus, Miss. September 6. They received the silver wings of a flying officer and commissions as second lieutenants in the Army Air Forces. They are Mario M. Hulsey, son of Mr. and Mrs. Jesse Monroe Hulsey, of 701 Elkmont drive, Guy Blalock Harris, son of Mr. and Mrs. Covert Durham Harris, of 792 Cumberland road; Edward D. Gillespie, son of Mr. and Mrs. J. G. Gillespie, of Savannah; Richard L. Lang, son of Mrs. E. M. Lang, of Calhoun; James A. Swindle, son of Mr. and Mrs. J. H. Swindle, of Ray City; Richard A. Young, of Savannah, and Berton Hugh Ramsey Jr., son of Mr. and Mrs. Berton Hugh Ramsey, of Statesboro. James A. Swindle was a pilot of the B-26 Marauder “Sarah E”. The plane may have been named after his mother, Sarah Ellen Swindle. His Crew Chief was Tech Sergeant D.H. Snyder, the Assistant Crew Chief was Cpl. Vincent J. Mosca, and Sgt. Chief McCarry was Grease Monkey. Other members of the crew have not been identified. James and his crew were assigned to the 451st Squadron, 322d Bombardment Group, Eighth Air Force. Part of the 322d Bombardment Group moved overseas to RAF Bury St Edmunds, England, through November and December of 1942 with planes and crews following March through April of 1943. Swindle departed for overseas in early 1943. Ongoing construction at Bury St. Edmunds forced two of the group’s squadrons to locate at RAF Rattlesden, and the group’s aircraft did not arrive until late in March 1943. James A. Swindle (far right, kneeling) with his crew in front of the “Sarah E”. The names of Lt. J.A. Swindle, Pilot, and Tech Sgt. 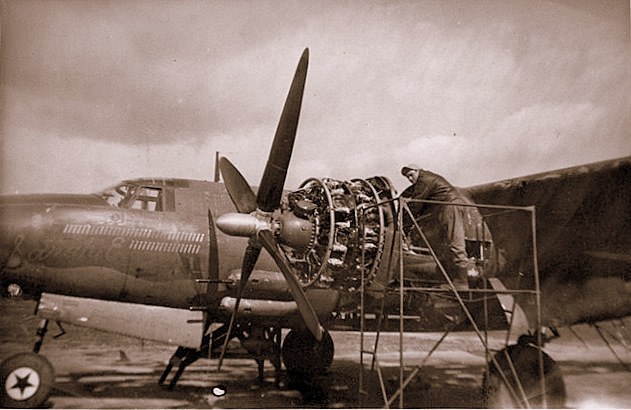 D.H. Snyder are visible on the fuselage below the cockpit. Image Source: Ron O’Neal. Once operational, the 322d flew two low-level bombing operations from Bury St. Edmunds. The first, on May 14, 1943 put up 12 planes for a minimum-level attack on an electrical generating plant near Ijtnuiden, a port city in North Holland. This was the first operational combat mission flown by B-26s in Europe. The second was a disastrous return mission to Holland. 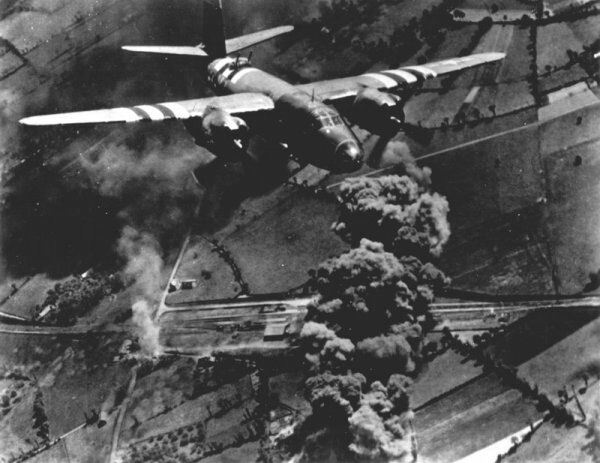 On May 17, 1943, 11 B-26 Marauders of the 322nd Bombardment Group (BG) took off for a low altitude bombing mission against the Ijmuiden and Haarlem Power Stations in Holland. With the exception of one aborting aircraft, all were shot down in German occupied territory. Sixty crewmen were lost to flak and interceptors. Group morale was not improved when, on 29 May, a B-26 crashed onto the airfield, killing the crew and damaging a hangar. After these missions, the group was re-equipped and trained for medium-altitude operations for several weeks before returning to combat operations. On 13 June, the 322d moved to RAF Andrews Field in Essex. The 322nd Bomber Group and other aircraft stationed in England were carrying out daylight bombing raids on German targets. The most direct bombing route to took the planes within reach of German interceptors at the Amsterdam/Schiphol airfield in Nazi occupied Holland. The Germans stationed dayfighters (mainly Me 109’s and some Fw 190’s) at Amsterdam/Schiphol airfield to attack the American bomber formations on their way to Germany. The strategic importance of the airfield and the growing threat to the success of attacks against Germany meant Amsterdam/Schiphol airfield had to be bombed. James A. Swindle at the controls of the B-26 Marauder. Beginning in March 1944 the 322nd bombed railway and highway bridges, oil tanks, and missile sites in preparation for the invasion of Normandy. A later newspaper article gave an update after James had completed 40 combat missions. Lt. Swindle has piloted a Marauder in 40 attacks against Nazi installations in enemy-occupied Holland, Belgium and France thus far. In addition to the D.F.C. he also wears the Air Medal with four Oak Leaf Clusters. He rates as his most interesting mission a recent attack against the Luftwaffe base at Amsterdam Schipol, in Holland, when flak fragments hit the windshield of his aircraft and spattered glass all over his lap. ” It was the most concentrated flak that I have ever seen,” he said upon return from the mission. On D-Day, 6 June 1944 the 322d Bomb Group attacked coastal defenses and gun batteries. Afterwards, during the Normandy campaign, the 322d pounded fuel and ammunition dumps, bridges, and road junctions, supporting the Allied offensive. On June 25th, 1944 a German Buzz bomb hit near the end of the runway where the 451st squadron was stationed. That day, the “Sarah E” completed her 100th mission. After D-Day Swindle’s group deployed to Advanced Landing Grounds in France and later Belgium. 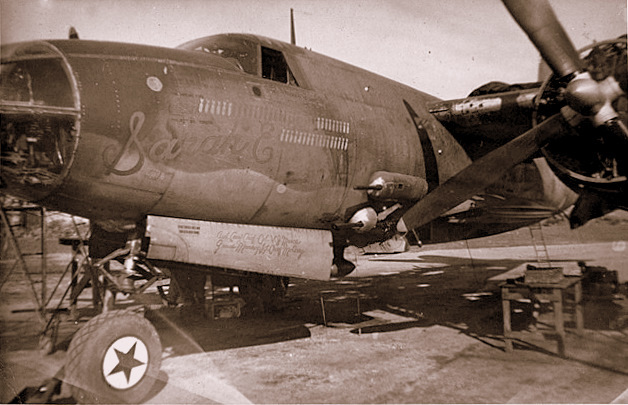 The 322nd Bomber Group Provided tactical air support and bombardment of enemy strong points and military targets to disrupt resistance to Allied ground forces advancing from the French invasion beaches and the ensuing offensives on the continent; 1944-1945. They attacked enemy forces as part of the Western Allied invasion of Germany in 1945 and continued offensive tactical operations in support of ground forces until German surrender in May 1945. The 322nd flew its last mission on 24 April 1945. After V-E Day, the group was assigned to occupation duty in Germany beginning in June 1945, engaging in inventorying and disassembling German Air Force equipment and facilities. The 322nd returned to Camp Kilmer in New Jersey in December 1945, and was deactivated on 15 December. 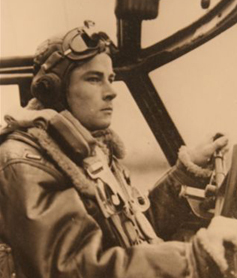 In all, James Aaron Swindle was decorated with the Air Medal with 12 Oak Leaf Clusters, the Distinguished Flying Cross, the African-European Campaign Medal, Caribbean Campaign Medal, and a Presidential Group Citation. He flew 74 combat missions between July 1943 and November 1944. 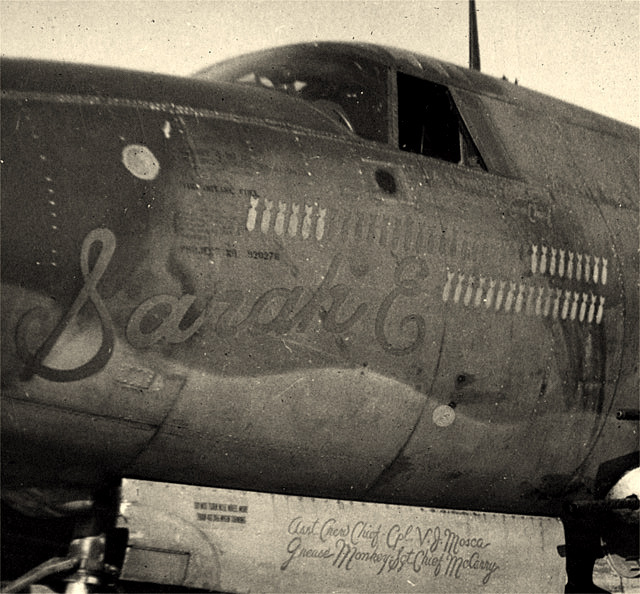 The B-26 Marauder “Sarah E” that was “his” plane was flown by other pilots. 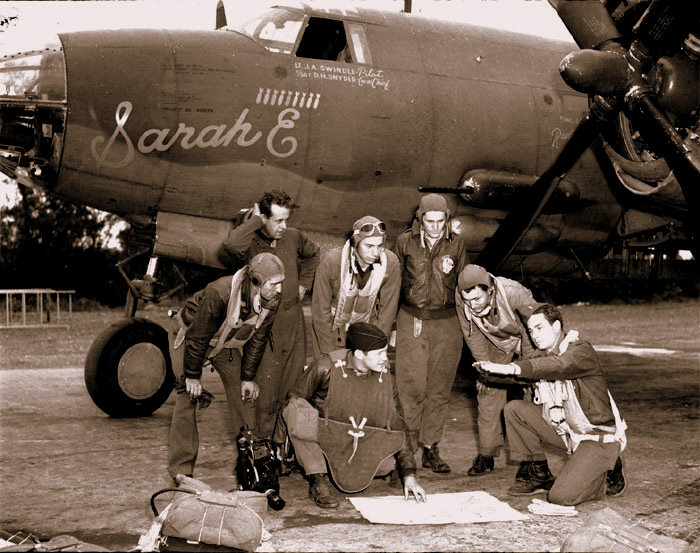 According to Marauder historian Trevor Allen, at www.b26.com, “Sarah E” completed 140 combat missions before running out of fuel and crashing into a cow pasture in France November 1944. Other Ray City AAF men included B-24 Liberator pilot Max Maurice Johnson, and flying officer Jim Paulk. Charles Shaw entered the Army Air Force and was trained as a mechanic for the B-17 Flying Fortress. Sgt. Mitchell Moore was assigned to the 854 AAF Bomber Squadron, 491st Bomber Group, flying as a crewman on a B-24 Liberator. Howell Shaw served at Sedalia Army Air Field and William C. Webb served in the Medical Corps of the Army Air Force. Lt. Jamie Connell, of Nashville, served as a navigator-bombardier. Saunto Sollami served in the Army Air Corp and came to the area after the war. Sergeant Dillard Markham was stationed at Moody Army Air Base when he married Ray City girl Ruth Boyette. After the war, James A. Swindle returned to his home town, Ray City, GA. He became a cattle rancher with land on Possum Creek Road near Ray City, a spread he called “Rolling Green Farm”. He married Betty Ann Patten from Lakeland, GA, a UGA Class of 1943 graduate with a Bachelor of Science degree in Heath Education. James A. Swindle was killed on September 10, 1993 when he was gored by one of his bulls. He was buried at Beaver Dam Cemetery, Ray City, GA.